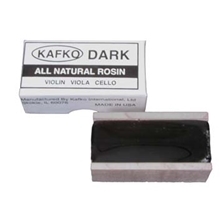 Kafko Dark Rosin- for use on violin, viola, or cello. Perfect for natural or synthetic bows. ***Note: During certain weather conditions (i.e. extreme cold or heat) we are unable to ship rosin. These times are in frequent and generally when temperatures are significantly below zero or above ~90 degrees.